Having visited Florida a number of times I feel like I have pretty much seen all I want to see in terms of theme parks, dinner shows and fireworks of an evening. That’s why I decided to try something a little bit different on my latest trip and go to a rodeo. 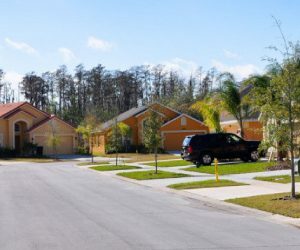 Rodeos are not really associated with the relaxed southern way of life in Florida, you are far more likely to run into a cowboy in Texas, but it seems there is still a strong network of bull riding, lasso wielding cowboys down in Kissimmee. I only heard about the rodeo by chance. I was looking through the usual mountain of leaflets advising you of the millions of attractions, shopping malls and restaurants in Orlando while I was waiting for my hire car to materialise and I just happened to spot the leaflet about Kissimmee’s rodeo. The leaflet also gave a $5 discount per person so I hung on to it just in case I decided to go and spot some cowboys. I’m glad I did. 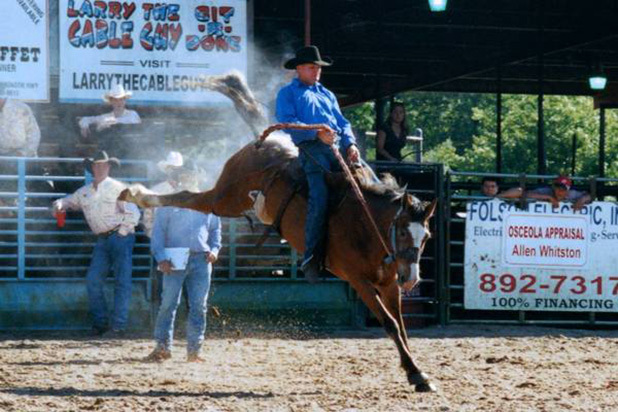 The rodeos in Kissimmee take place every Saturday at 7pm at the Kissimmee Sports Arena which is just off Highway 192. The sports arena is used purely for rodeos and whilst it’s not exactly Old Trafford there is plenty of seating on the covered stands that overlook the sand arena where all the action takes place. Entry is $25 for adults (or $20 with the coupon) and $10 for children over 5. Kids under 5 get free entry. It was a pretty cold and wet evening when I headed over to the arena but there was still a good turn out and it wasn’t just the local Florida residents that had come out to support their local cowboys. There were quite a few Brits; plus visitors from Norway, Sweden and Ireland so it was a pretty international affair. Bull riding was the opening event, accompanied by the sounds of ACDC, Billy Idol, Bruce Springsteen and a number of other American classics! I’d spotted some of the bulls in pens at the back of the arena when I arrived and I thought they looked pretty small; the reason for this soon became apparent… The first bull rider was introduced as a newcomer to the sport, at 7 years old! If you are particularly concerned about health and safety then it is probably best to look away as a tiny 7 year old child comes charging out of a pen on a marauding bull but it seems this is the norm in the world of rodeo so you really just have to throw yourself into it and whoop along with everybody else! Older bull riders also appeared later on but they seemed to have just about as much luck as the 7 year olds when it came to clinging on to a crazy bull. Another event was ‘barrel racing’ which I assumed involved people rolling barrels quicker than their opponents but I was totally wrong! Barrel racing involves horse riders manoeuvring around 3 upright barrels as fast as possible without knocking them down before racing to the finish line in the quickest possible time. This was actually a really gripping spectacle and some of the riders (who were also as young as 7) were amazingly fast and agile on horseback. Next came the ‘calf scramble’, another health and safety nightmare which was both hilarious and slightly terrifying! Children from the audience were invited into the arena and 2 small calves were released with ribbons tied to their tails. The two children that managed to get the ribbon off the tail were rewarded with a prize, simple! The official minimum age to take part in the calf scramble was 4 but there were definitely kids in there as young as 2. Needless to say they didn’t manage to catch the cow but they like to start them off young! One of the victors was a young boy from Cornwall who was delighted he had won his first calf scramble. After an impressive display of stunt horseback riding from 2 young ladies it was interval time where burgers, hot dogs, steak and beans and popcorn could be washed down with Bud Light. You could even buy yourself a cowboy hat for $10 from an Air Stream caravan that was parked up by the stands. This seemed to be doing a roaring trade. The second half of the show was really pretty much the same as the first and I left a little early as it was a chilly evening (by Florida standards) and I wanted to get warm, however I would thoroughly recommend visiting Kissimmee rodeo as part of your Florida holiday. The whole event had a great atmosphere and the focus really is on fun. It was clear that most of the participants came from a long line of Florida cowboys and they all knew each other well and really enjoyed being part of a community. This is a great anecdote to the sugary Disney World theme parks and great fun to boot. Besides, where else are you going to find a 7 year old riding a bull? 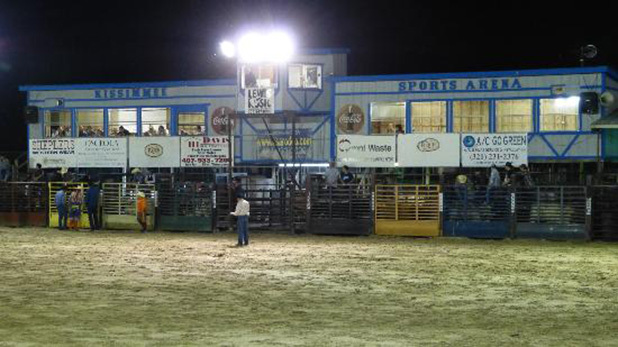 For more information about the rodeo visit www.kissimmeerodeo.com. 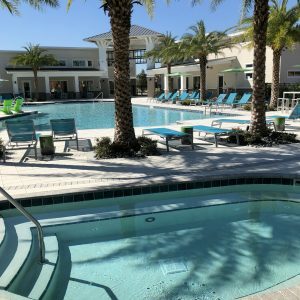 Visit Panoramic Villas today to view our Holiday Homes in Florida and book your dream holiday in the Sunshine State now! This entry was posted in Florida, Kissimmee and tagged Entertainment & Culture on February 17, 2014 by Jess Whittle.